Go Hwy 69 through Emory to CR 515 (Brookshires on the corner). Turn east on CR 515 and drive 1.4 miles. Turn north onto CR 3190 (near a white water tower) and drive 0.5 miles. Turn east (right) at the dead end. Follow 3190 for 1 mile. There will be several curves. Go past Scarbrough Meadows and Scarbrough Orchard. Turn east (right) on 3160, and follow the road 1.7 miles through several more curves until you reach a dead end. 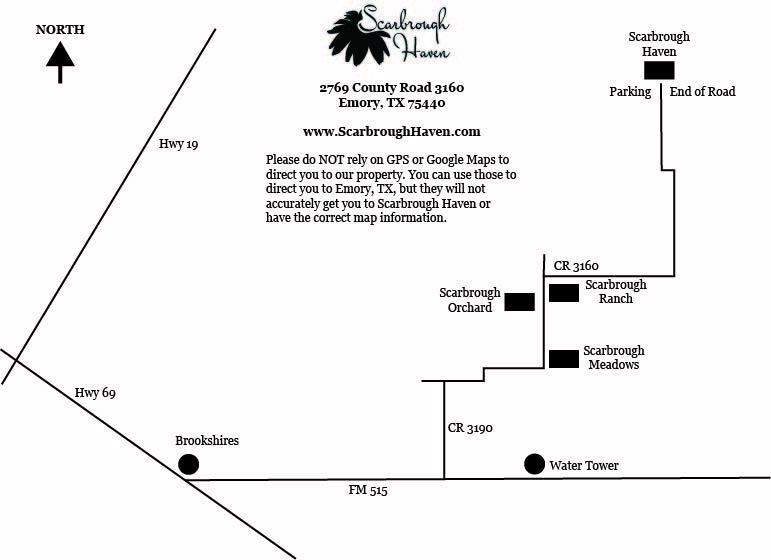 You have arrived at Scarbrough Haven.